Now that we have a few seconds to breathe before the holiday rush is upon us, I just had to take a minute and talk about my favorite all time favorite-like can’t live without kind of thing- boutique. For dogs of course. Hey, just because I happen to be a Perky Pekingese Steiff named Sassafrass Jones does not mean I don’t get to enjoy the finer things in life…or at least admire them like a doggie in the window. This window: Tails in the City. Located in Chicago, this dog boutique is about as chic as they come. The owners, are Mama Sassafrass’ good friends, Phillip and Bruce. And boy do they know how to spoil the pooches. I have heard all about them over the years, but I actually got to meet these two genius’ at Dry Bark, our big party to raise awareness for Canine Companions for Independence in Atlanta. Can you believe they came all the way down to Atlanta just to support the cause. And since the holidays are almost here (We have already started counting down the days), I decided A Holiday Wish List from Tails in the City just what the doggies ordered. So, Mama Sassafrass (AKA Cathleen Smith) please take note, these are the top five gifts for our pampered dogs that we are lusting for this season from our fave retailer Tails in The City. because what dog can resist this plush squeaker toy from Haute Diggity Dog? It’s always Happy Hour at Habersham Forest. Click here to buy! Maybe the Black Americanine Express dog toy for those big spenders, a Chewnel classic for the prissier pup, or an Hairmes Gift Box for the dog who enjoys only the finest things in life. All of these an more are available online at www.tailsinthecity.com or in the flagship Chicago store. Guess what? You can carry a little plush Steiff animal everywhere you go. How you may wonder….with a Sassafrass Jones Steiff keyring. We took the plush little Steiff cuties into our Habersham Forest Style Studio and dressed these animals in top-notch fashions. Okay, so maybe I personally can’t take credit for these guys, but I was there watching it and I did have some say in who should wear what. Like the panda in the tutu, that was all me. Okay so here they are: The best way to upgrade your set of keys or even your purse or backpack. Just hook these little cuties and get ready to go. All of these are available for purchase on our website. Which one will you choose? A must-have gift for yourself and for all of the friends in your life. 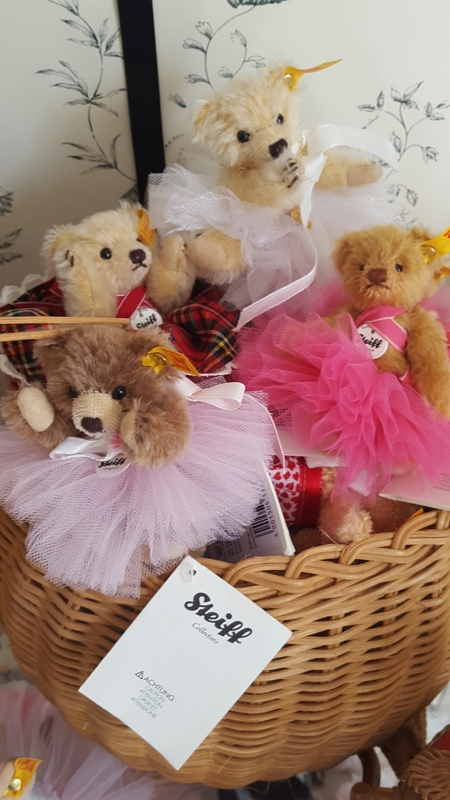 Makes sure to check out our website, http://www.sassafrassjones.com for a brand new selection of custom-dressed Steiff Forever Friends by Cathleen Smith-Bresciani. The star of the afternoon was special guest Rebekah Kaufman, who came all the way from Boston, with three of her teddy bear buddies from Steiff. After tummies were full, Rebekah gave a little talk about the history of Steiff and the teddy bears, and we got to meet some of the coolest and oldest Steiff bears ever. Her travel buddy was made in 1906, and boy was he in good condition. He was adorable, dressed in LEE overalls that were actually made as a salesman sample in the late 1920s. She gave the people and us Steiff animals the secret formula for identifying the age and value of the Steiff. All the guests were fascinated by the “secret formula” but we will be respectful and keep it a “secret” because that makes it more fun. The second bear she brought was called a Doll Bear. It was so cute. It had these big lips and open mouth. Steiff made these to look more like a doll and we all oohed and aahed over this little guy. Some of the guests asked questions about other Steiff animals and there values. Here are some crazy things we learned. Name an animal of any kind, and Steiff has made it at some point. They even made five fleas in five different colors at some point in the 90s. And the worst: there is a cockroach Steiff. Yuck. But back to the good stuff. Thom Baker, photographer extraordinaire, snapped away at the guests and captured the bears and the ambience in a very magical way. Children that came got to leave with a little basket filled fun items like bubbles shaped like a teddy bear. And of course, people could not get enough of the custom-dressed Steiff animals made by Sassafrass Jones . The little baskets were filled with bear-y cool goodies for the little ones to take home. Steiff teddy bears dressed in custom Sassafrass Jones outfits were the hit of the party. People and their kids nibbled on fun teddy bear bites and teddy bear-shaped sandwiches at Café Lapin. And, of course, there was endless cups of tea. Rebekah Kaufman and Cathleen Smith Bresciani (aka Mama Sassafrass) and host of the magical afternoon. Mama Sassafrass (Cathleen Smith Bresciani) wanted me to make sure to thank all the people who attended the magical afternoon of tea and teddies. An extra special thank you to Thom Baker, the photographer, Mattie Hines, a friend and owner of Café Lapin, and Rebekah Kaufman, who travelled from Boston for this delightful afternoon. Happy May! 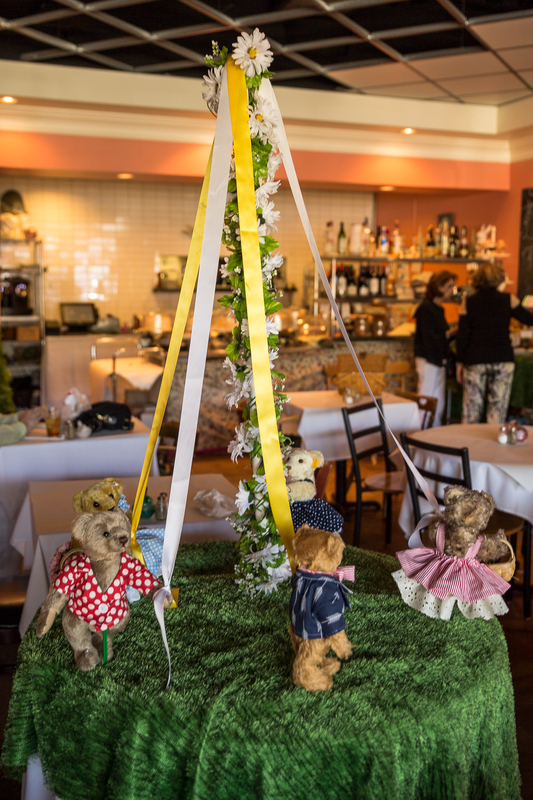 As all of us at the Habersham Forest are counting down the days to our Teddy Bear Tea Party in Atlanta, we have all types of cuddly bears on our mind. 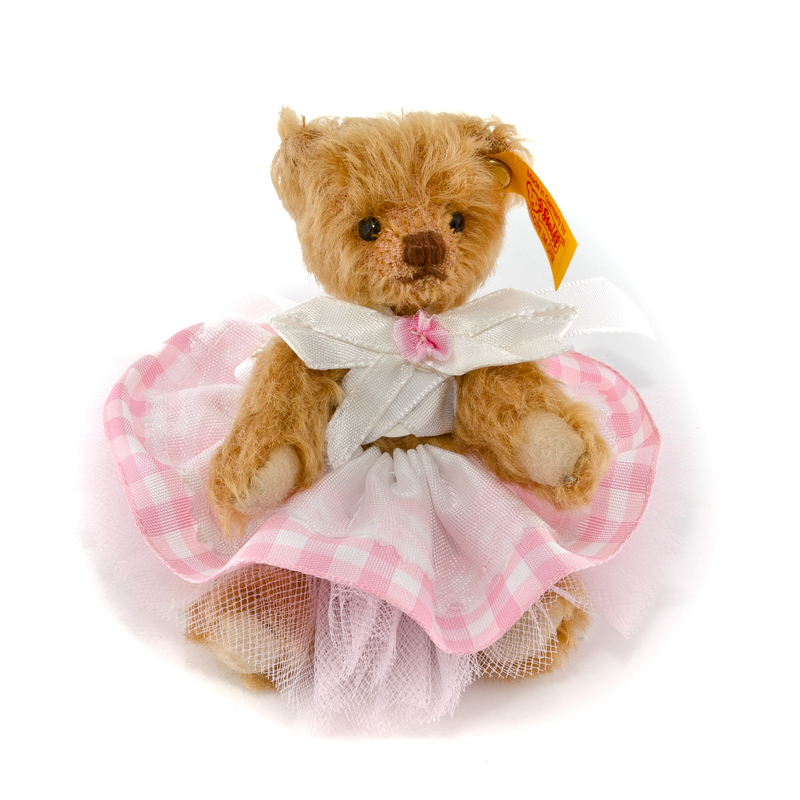 Today, we love our Mini Steiff Teddy Bears! They are just as cute as can be and are the best little travel buddies. If you don’t know this already, we sell designer duds for your dogs on our website (in addition to the books and Steiff friends and of course my very own Sassafrass Jones stuffed dog). Mama Sassafrass has always made sure her pets, both real and of the Steiff variety, are dressed to the nines with everything fitting and feeling just perfect. But we are most excited to introduce a brand new item: The Sassy Harness. Made for the hautest canines, this step-in harness will make any dog realize just how special they are. The red polka dot leash, made of cotton, is embellished with a leather version of our signature Chartreuse cat-eye glasses for a touch of glamour. Be the cutest canine and order your leash today…(click on the link below to order now). Hope you enjoyed this SassySession! Last weekend, Mama Sassafrass took me along with her to the annual miniature doll house show. It was so much fun! You would not believe how many fabulous miniatures there are out there. Of course, Mama was on a mission, picking this and that for her next book, but I still had a few hours to peek around the show. Here all the best tiny miniaturist and artisans sell their pieces to a group of doll house enthusiasts among other types. I just like how everything is so bite-sized. I mean, some of the things I saw were even too small for me. But I had a blast and got to see the talent of so many fabulous designers and sellers who must have the best eyes and tiniest little fingers to make the things they do. ***SassyFact: The two books by Cathleen Smith Bresciani (AKA Mama Sassafrass) are filled with colorful and real life vignettes made with Steiff animals and miniature pieces. With the talent of mini architect Chris and the other talented minds in the Habersham Forest, Mama Sassafrass creates magical displays for everything. The ABC book, Sassafrass Jones’ ABCs pictures each Steiff with a little poem. The pictures are photographs of the real animal in its own little miniature set. You may already know that, but if you didn’t, it’s something that is too good not to check out. Mind if I join you two? These books are all handmade by this cute girl who we buy from on Etsy. She even has kits that show you how to make your own miniature books. Look at these fabulous sterling silver minis. I will eat my kibble out of one of these stunning pieces for sure. Perfect for a Sassy Picnic! Think I would look good in this necklace? So it was a fun-filled day as you can see, and we went home with bags and bags of new things. I think Mama Sassafrass even bought me a few gifts, because she would not show me everything. I can’t wait until next year’s show. Until then, of course, we can always go to our favorite playland of miniatures, Miniature Designs. This store always has the best of the best and we can spend hours in there drooling over their latest finds.